Cancer starts with an alteration in DNA. This causes cells to grow uncontrollably, and abnormally, forming a malignant tumor- which is cancerous. The human body has approximately 100 trillion cells. Under normal conditions these cells reproduce themselves in an ordinary way. Cell growth (cell reproduction) takes place so that old, worn out tissues can be replaced and injuries can be repaired. Cell growth is controlled by deoxyribonucleic acid (DNA) and ribonucleic acid (RNA) found in the nucleus of each cell. 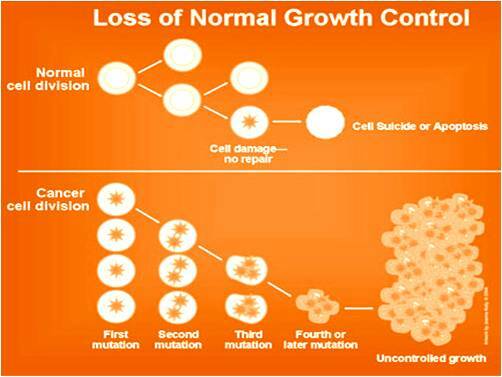 When nuclei lose their ability to regulate and control cell growth, cell division is disrupted and mutant cells can develop. Some of these cells might grow uncontrollably, and abnormally, forming a mass of tissue called a tumor, which can be either benign or malignant. Benign tumors do not invade other tissues. They can interfere with normal bodily functions, but they rarely cause death. A malignant tumor is a cancer. More than 100 types of cancer can develop in any tissue or organ of the human body. In other words any type of cancer begins with a change in DNA. Found within DNA are ontogenesis and tumor suppressor genes which normally work together to repair and replace cells. Defects in these genes- caused by external factors such as immune conditions, hormones and genetic mutations- ultimately allow the cells to grow into a tumor. A healthy cell may duplicate as many as 100 times in its lifetime. Normally, DNA molecules are duplicated perfectly during cell division. In the few cases when DNA molecule is not replicated exactly, specialized enzymes make repairs quickly. Occasionally, however, cells with defective DNA keep dividing and ultimately form a small tumor. As more mutations occur, the altered cells continue to divide and can become malignant. A decade or more can pass between carcinogenic exposure or mutations and the time cancer is diagnosed. The process of abnormal cell division is related indirectly to chromosome segments called telomeres. Each time a cell divides, chromosomes lose some telomeres. After many cell divisions, chromosomes eventually run out of telemeters and the cell then invariably dies. Scientists have discovered that human tumors make an enzyme known as telomerase. In cancer cells, telomerase keeps the chromosome from running out of telomeres entirely. The shored strand of telomeres now allows cells to reproduce indefinitely, creating a malignant tumor. Telomerase seems to have another function that is still under investigation. After many cell divisions, by nature cancer cells grow old, but telomerase keeps them from dying. If scientists can prove that telomerase plays such a crucial role in the formation of tumor, research efforts will be directed to finding a way to block the action of telomerase, thereby making cancerous cell die. It is my hope that you now know how cancer starts. Below are other articles related to cancer.